To mark the completion of our product redesign process there are special offers available allowing you to get your hands on a brand new speed indication device at a special, one off price. Anything purchased through a special offer retains the complete warranty package you would expect and is sold, unless otherwise stated as brand new grade A stock. 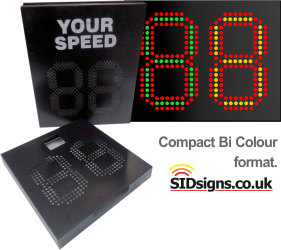 Slim line all aluminium construction speed indicator. When traffic is travelling over your speed limit the speed is displayed in Red. If traffic is travelling under your speed limit the speed is displayed in Yellow or Green. 1x intelligent lithium ion mains charger . This represents everything you need to start using a speed indication device straight away. If you would rather have your sid as a mains powered device then conersion can be done at no extra cost. Solar power can be added to these bi colour systems for a small upgrade cost. Extra lithium ion batteries can be added with room for two to be run at the same time within the battery box. These bi colour systems have been manufactured in a limited production run and are available at a very attractive price; more than 50% cheaper than some other systems from other suppliers. Call us now on 0800 413 892 to find out more.